You may have heard that Elle Woods is hopping on a plane to dazzle us with her talent in the upcoming Atlantis Productions’ presentation of Legally Blonde The Musical. Based on the novel by Amanda Brown and the hit film that catapulted Reese Witherspoon to stardom, Legally Blonde The Musical features Nikki Gil as Elle Woods, the girl who doesn’t take “no” for an answer. When her boyfriend dumps her for someone “serious," Elle packs up Bruiser and her designer clothes, hits the books and sets out to go where no Delta Nu has gone before: Harvard Law. Along the way, Elle proves that being true to yourself never goes out of style. Simply accumulate P15,000 spend* on your Metrobank Femme Visa or any other Metrobank Credit Card and you’re on your way to getting up to 50% off on tickets to the exclusive June 25, 2010 gala at the Meralco Theater. Just submit your charge clips at any Ticketworld outlet for validation. 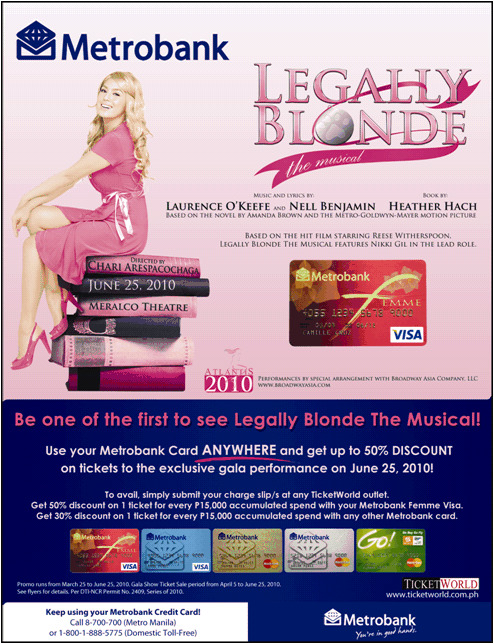 Don’t miss out the opportunity to unveil the Elle Woods in you! Get your tickets now! Call Ticketworld at (632) 891-9999 for details.